How can I “fall in love” – divine love (which I will call by its Sanskrit term, bhakti)? I cannot get bhakti by changing my hairstyle, by changing my wardrobe, my cosmetics or my name. I cannot get it by joining a religion, nor by leaving a religion; by being a member of a society or by not being a member. I can’t get it by changing where I live, or when I wake up. I can get it neither by following rules, nor by breaking them. All the rituals and magic in the world will not make it materialize. Nor can I grasp it by studying every book, every commentary, and every philosophy there is to study. Nothing I give away can give bhakti to me. Nothing I give up, nothing I forego, nothing I renounce, nothing I willingly suffer can bring me any closer nor push me any further from bhakti. 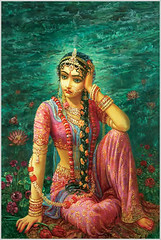 No luck, chance, fate, fortune, or other blind mercy will bring bhakti into my heart. Only love can create love. I cannot get divine love until that monumentally rare event occurs wherein I encounter a person who has it. It is like a divine virus. When I finally meet a carrier, I must not miss that incredibly rare opportunity to myself become infected. The air from their lungs moves across the bhakti-saturated core of their being as it travels upwards, past their vocal chords, through their lips, and emerges in the sensorial world as a pronunciation of the beloved’s name, “Kṛṣṇa,” “Govinda,” “Śyāmasundara;” a proclamation of the beloved’s beauty, excellence and uncommonly attractive activities. These bhakti-infected vibrations enter through my ears into my nervous system and thus come into contact with my own conscious core. The circuit is complete. The transmission of the divine germ of bhakti has passed from one heart to another. There is no other way to attain bhakti. There is no other way. There is no other way, at all. I must find a person who has bhakti and I must expose my heart through my ears to the sounds of bhakti emanating from that person. Nothing else works, nothing else. The way I obtain the seed of bhakti is the same way that I nurture it, cultivate it, and develop it into fruit bearing vine enrapt around the strong, dark legs of the Kṛṣṇa-tree. There is no way to advance in the yoga of divine love besides opening our ears and heart ever wider to the transmissions of loving sound emanating from the hearts of divine lovers of Godhead. May we abandon all the vanities of all other means. Previous Have I Made Progress in Bhakti Yoga?